A NEW MODEL FOR WIDE BANDGAP SEMICONDUCTOR MANUFACTURING IN THE U.S.
Power semiconductor devices are critical to America’s energy infrastructure—all electronics, from laptops to electric motors, rely on them to control or convert electrical energy to operate properly. Despite their importance in our energy infrastructure, today’s power semiconductor systems are based on silicon semiconductors which are energy inefficient, have a limited upper operating temperature, and the silicon-based (Si-based) power converters have a large form factor (due to the large magnetic components required at low switching operating frequency) making them bulky and heavy. Innovative new semiconductor materials, device architectures, and fabrication processes are needed to improve the performance and efficiency of existing electronic devices and to pave the way for next-generation power electronics. Emerging semiconductor materials remain significantly more expensive than the silicon devices they seek to displace, thus limiting their widespread adoption. This remains a significant engineering challenge. Achieving higher energy efficiency and performance requires low-loss power semiconductor switches with significantly better performance than incumbent Si-based transistors and thyristors. Wide bandgap (WBG) semiconductor devices provide designers with the capability to create systems with higher efficiency, higher temperature tolerance, and higher frequency than previously achievable. Substantial technical progress has been made on WBG-based power switches over the past decade creating opportunities to develop new high performance, high-efficiency power electronic systems. In particular, Silicon Carbide (SiC) is an emerging power WBG semiconductor because its electrical, thermal, and mechanical properties allow it to surpass the performance of conventional silicon power technology. It is an excellent candidate for next-generation high temperature, high-frequency switching devices for commercial applications including industrial motor control and DC to AC inverters to enable renewable energy adoption. Today, SiC devices are significantly more expensive than Si devices. However, new opportunities for substantial cost reductions have materialized in recent years as larger 6” substrates have become available and SiC device fabrication processes have become more mature. Working within the ARPA-E SWITCHES program, Monolith Semiconductor’s project goals are to develop 1) high performance SiC-based power diodes and transistors operating at 1200 V and 100 A, and 2) a high volume, low-cost manufacturing process that is capable of delivering the devices at low cost (≤ $0.10/A). 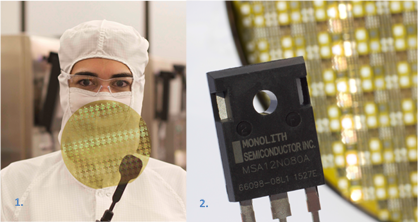 The Monolith team’s approach is to design SiC devices and fabrication processes that are compatible with existing high-volume silicon manufacturing facilities to help drive down the cost of SiC devices. To accomplish this, Monolith Semiconductor is partnering with X-Fab Texas, a high volume 150mm silicon semiconductor manufacturing foundry, to develop all of the process and manufacturing innovations required to enable SiC metal–oxide–semiconductor field-effect transistor (MOSFET) fabrication on 150mm SiC wafers in X-Fab’s complementary metal-oxide semiconductor (CMOS) manufacturing facility. Specific challenges for SiC devices involve creating designs that are compatible with standard Si processing steps as much as possible, while optimizing the performance of the SiC power devices. An initial processing challenge was the optically transparent SiC wafers, which were difficult to handle on many of the existing Silicon fabrication processes and tools that rely on different methods for positioning and moving Silicon wafers. Monolith and X-Fab developed processing and tool updates to allow processing of transparent SiC wafers on the silicon production line. Special consideration needs to be applied to the gate oxide process for SiC MOSFETs, as the formation is more difficult compared to Si and can easily result in degraded device performance. Monolith has developed state-of-art SiC MOSFET gate oxides, and through a partnership with the National Institute of Standards and Technology (NIST) has quantified the long-term reliability of these oxides operating at temperatures up to 300°C. The team has demonstrated design and fabrication success with SiC diodes and MOSFETs on the production line. Initial device yields on 150mm diameter SiC substrates using standard Si processing steps were low due to insufficient process margins for the SiC devices. Device design changes and processes improvements were implemented to improve the SiC process margins and increase the yield to commercially acceptable levels. The team has demonstrated high-power SiC diodes comparable in performance to the state of the art. The Monolith team has also designed a prototype novel, high performance 1200 Volt SiC power MOSFET with a specific on-resistance <3 mΩ-cm2 . The team is continuing to develop advanced device designs and processes to further reduce cost and improve performance. Their goal is to demonstrate 1,200 Volt SiC MOSFETs with currents >100A in a high frequency boost converter to quantify the performance advantages of their devices. The boost converter will enable a direct comparison to the current state of the art to gauge performance and competitiveness of the value chain. Working in an active Si foundry provides significant cost benefits. By using the existing silicon manufacturing infrastructure, Monolith can dramatically reduce the overhead costs to manufacture SiC devices, while maintaining high quality, taking advantage of X-Fab’s existing silicon process controls and quality systems. The equipment, labor, and utility costs, are spread over the large volume of wafers (silicon and SiC) processed at X-Fab. Monolith gains the cost advantage of high volume production even during initial low volume production of SiC devices. This approach is demonstrating the potential for significant cost savings over other competing SiC device manufacturing approaches, which use small or captured fabrication facilities. The combination of Monolith Semiconductor’s SiC MOSFET design, low–cost process, use of 6” SiC wafers, and a silicon foundry manufacturing model is demonstrating promise to dramatically reduce the cost of SiC high voltage switches. Monolith Semiconductor’s innovative device and manufacturing model together with their demonstrated early device yields and high blocking voltages (>1200V) has attracted investment from the Army Research Laboratory, and in December 2015 they announced a strategic partnership with circuit protection device company Littelfuse Inc. of Chicago, IL. This relationship will accelerate development and help bring silicon carbide technology to the market, increasing customer reach as well as providing access to global channels through Littelfuse’s deep sales and marketing expertise. Monolith Semiconductor is also an active member of the DOE-supported National Network for Manufacturing Innovation (NNMI) PowerAmerica institute, which is led by North Carolina State University, set up to advance the deployment of WBG-semiconductor-based power electronics in the United States. While SiC is already gaining traction in some energy-intensive applications, significant cost reductions, as being pursued by Monolith Semiconductor, will enable adoption of SiC devices in a variety of power electronics applications, including vehicles and motor drives. This will continue to drive advances in power electronics and help facilitate greater adoption of electric vehicles, which in turn will help reduce U.S. oil imports. Moreover, efficient power electronics systems promise reduced electricity consumption, resulting in fewer harmful energy-related emissions. Lastly, the manufacturing model Monolith Semiconductor is demonstrating for SiC could trigger a breakthrough approach in the way companies accelerate the adoption of emerging technologies within the existing semiconductor value chain. The Monolith team’s project has generated two U.S. Patent and Trademark Office (PTO) patent applications.